Here's where you can see stuff IRL. But to be honest, I'm including some URLs in here too. Need a cure for your Monday? Come on over, sit back, and let these singular sensations give you some laughs. From stand up to musical parody to storytelling to characters, they've got you covered! The Bat is a longform based on The Harold, but with one key difference: it all takes place in the dark, and the improvisers only have their voices to communicate. This form challenges performers to build their listening skills, and to focus on creating characters and relationships with voice alone. Students will test and push the boundaries of what they can do with their voices, and provide a unique experience for the audience as well. It's like modern improv meets old-timey radio! The eight class sessions are followed by a four week run of shows, giving students an enhanced opportunity to learn by doing, over time, in front of a real audience. Dreams and nightmares become the jumping off point for New York City improvisers to delve into madness and find a happy place in "Pretty Bad"-a show that takes the good, the bad, and the bizarre to make comedy. Every second Thursday of the month. With a character-driven style and contagious energy, indie improv team The Mannequin Room whips worlds into shape.Then, like a tornado of glitter and sass, they break everything apart again just to see what’ll happen. They’ve been doing this for years to the delight of fans, children, ambassadors, drag queens and ghosts from all over the world. 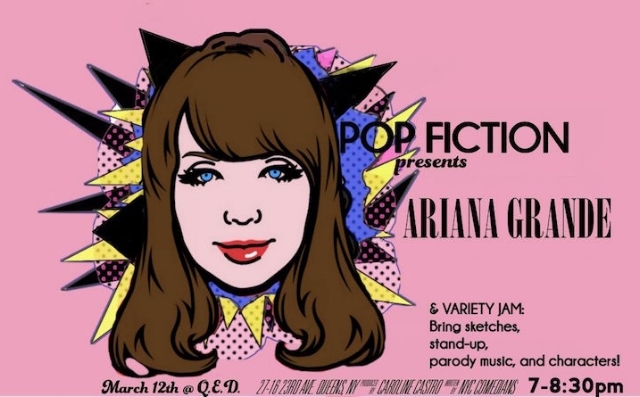 Pop Fiction is a show brought from the weird mind of Caroline Castro as she attempts to be the sexiest Weird Al Yankovich ever. Old tunes rewritten with new messages, quirky lyrics, and pop star magic! Enjoy a mini parody concert, fake celeb interviews, laughs, and more as we explore a different diva every month. March's muse is Ariana Grande, and the Variety Jam that follows gives us all the more reason to CELEBrate! All written comedic work is welcome: sketches, parody songs, stand-up, and characters will take the stage as we enjoy the show! Next show: March 12th at 7:00pm. Funnier together. This lady run sketch show takes place at The Magnet Theater. Come to the Commons Theater in Brooklyn for a night of funny wacky improv!